﻿​Need to get your Gutters cleaned or repaired in Atlanta Georgia? Great, now that you have landed on our website, go ahead and fill out the form to the right or call us today! We can help un mangle the growth that has built up in your gutters if it looks like a small forest coming out of them, or just clean them out, repair or replace them entirely. There is not a gutter job in Atlanta that we can't handle! It is our expertise and we take great pride in servicing gutters in and around the city including all of the suburbs as well. Unlike some of the other company's out there that do roofing, siding, painting, and gutters, we specialize in gutter repair, replacement, and gutter cleaning in and around Atlanta Metro. This gives us the most expertise in handling gutters, and any service or problem related issues that may arise. If it comes down to gutters, we know our way around the repair or cleaning and will take care of it immediately or schedule during your time frame. You are the boss, so let us know what we can do to help! Call by clicking the button below! Professional Service and Gutter Repair or Installation. Call the Professionals for Atlanta Gutter Cleaning so you can rest assured that the job gets done right on the date of your choice. Usually we can take care of you on the same day, but if you need special scheduling, or want to set up for a week down the road, we can be flexible with your time frame. Our crew is ready to serve you and clean out those dirty, filled up gutters or repair a downspout that isn't attached properly. Contact us for an inspection of your gutter system if you are getting ready to sell your house as well and we can assess the system entirely and let you know what to expect. Our job is to get your gutters to be an asset for your home or building, so that the water intrusion doesn't end up degrading the soffit and facia boarding of your home or business. Water damage is the single most costly problem and is usually 100% avoidable with a properly functioning gutter system. We are the pros in Atlanta Georgia and love Gutter cleaning, repairs and replacement jobs, or just a simple clean out. ﻿﻿﻿Our team is on standby ready to serve you at your home or business today. Give us a call to experience the most professional gutter cleaning company in Atlanta, Georgia and surrounding areas. We will service all of metro Atlanta, and the suburbs. So if you are located in Marietta, Woodstock, Kennesaw, Smyrna, Roswell, Sandy Springs, Dunwoody, Alpharetta, Johns Creek, Peachtree Corners, Norcross, Lilburn, Duluth, Lawrenceville, Suwanee, Buford, Sugar Hill, Acworth, Snellville, Grayson, Loganville, and anywhere nearby, we can take care of you. No one deserves to have a bad gutter system here in Atlanta. We can solve that today! Each tech is factory trained and has the experience to perform the gutter cleaning, repair and quote you on any other services as well. If you need new installation of gutters, we have you covered since we have our own equipment in house! Also, we can go ahead and pressure wash anything you need at your home or business as well. Decks, driveways, sidewalks, roofs, exterior siding are all services that we can do for you once we get there for the gutter cleaning. Our guys are happy to help you with all of those other jobs. 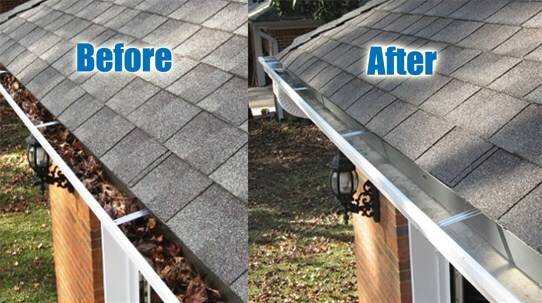 Find out why we are the fastest growing gutter cleaning company here in Atlanta. Call us today or fill out the form on this page. Simply put, we are the Michael Jordan of gutter cleaning and repairs in Atlanta GA. The Showstoppers, call us today to schedule your gutter man to come out and delight your gutters with a professional repair, cleaning or replacement estimate to get your property back routing water the right way. Too many delays will cause a water intrusion problem for your windows, doors, and soffit facia boarding on the underside of the roof. Call now, don't delay!